I have been thinking a lot lately about stories of violence. Both stories of terrible things happening out there in the world (the attacks in Paris and Beirut, the bombing in Nigeria, the on-going violence in Syria and in so many other places) and stories of violence in our sacred texts. Just as there seems to be no shortage of violence in our world, there is no shortage of violence in our sacred stories. And what is most unsettling is when it is asserted that this violence is somehow connected to God. The terrorists who carried out the attacks in Paris last Friday seem to be connected to those doing violence in Syria and Beirut, and they like to cite verses in the Quran as justification for what they are doing. In other words, they like to say that they are doing God’s work and carrying out God’s will. As many prominent Islamic scholars have pointed out, their theology is the result of what I like to call a bad digestion of their scripture, and the interpretive tradition that surrounds it. In other words, they are taking verses out of context and cherry-picking from their tradition to justify their own violence. I have no doubt that the leaders of their movement do believe that they are doing God’s work. But I also think their desire to do violence came first, and searched the Quran with its twisted lens to find what it needed to justify itself. Lest us Christians be tempted to think ourselves better than that, I would remind us all that while violence in the name of Islam may currently be the focus of our attention, violence in the name of Christ has recurred many times in history. The most infamous example that comes to mind, perhaps, are the Crusades. But the Lord’s Resistance Army has been operating in Africa for a number of years now essentially as a Christian terror group, and the Ku Klux Klan’s long history in America is also a history of terror dressed up within a twisted interpretation of the Christian tradition. Just as there are those who twist the Islamic tradition by focusing on Quranic verses and stories that seem to show God either doing violence or endorsing it, so there are those who do the same with the Bible. And there is no shortage of stories in the Bible that seem to involve God in violence: acting directly against people (as in the flood story in Genesis), or ordering people to do violence to each other (as in some of the stories connected to ancient Israel’s entrance into the promised land), or seeming to justify the use of violence (as in legal injunctions requiring capital punishment). When these sorts of stories are read casually, and without much digestion, it is frighteningly easy to convince one’s self that God endorses the use of violence. But for those who us who are Christian, claiming to be followers of Jesus, all these stories that seem to involve God in violence must be read and understood through Jesus and his proclamation of the kingdom or reign of God. It is this Jesus who told us to turn the other cheek and counseled us to love our enemies and do good to those who hate us. It is this Jesus who forbade his disciples to fight against those who came to arrest him, and who allowed himself to be killed on the cross. Jesus dedication to non-violence was deep and profound. Christians trust that when we see and hear Jesus, we are seeing and hearing God expressed in the context of a human life. Thus, if we see in Jesus a commitment to non-violence, then it seems to me we must conclude that this is a proclamation of God’s own non-violence. In other words, we must conclude that God is not involved in violence. Rather than being something sacred, violence is revealed to be something secular. It is revealed to be a human thing, not a divine thing. So what, then, are we to do with all these stories that seem to involve God in violence? We are, I think, to understand them as stories that are, in fact, revelatory of our devotion to violence, a devotion that runs so deep in us that we will go to great lengths to justify it. And that includes using God and claiming divine command or approval of our violent acts. We are accustomed to thinking of the Bible as teaching us about God — and it does. But it also teaches us about ourselves. The philosopher René Girard, who died just recently, saw in the way the gospels present the crucifixion of Jesus an incredible honesty: they show the crucifixion as exactly what it was, an act of murder by people who were deeply fearful of who Jesus was and what he represented. Girard believed that the crucifixion narrative had the power to reach out to us and reveal to us our own violence, the way in which we make others into victims for all sorts of reasons. When we read the rest of the Bible in the light of what the crucifixion reveals about us, then the connection between God and violence is broken, and we see these older stories for what they are: human attempts to justify their own violence. But notice what Christians did with the crucifixion story. Rather than allowing it to stand as an event that revealed our own violence, we turned it into a story about God’s violence. We constructed elaborate theologies that imagined that God needed or wanted Jesus to die so that we could be forgiven. We turned the crucifixion of Jesus into a fairy tale about God’s need for violence rather than allowing it to be an honest, deeply real story about our own need for violence. And if we are able to imagine God needing the death of the one we call God’s Son, then we can imagine God needing all kinds of violence in the service of some supposedly righteous end. There perhaps has never been a greater need in the human family than there is today for us to seriously go about doing the work of deconstructing the myth of sacred violence in our religious traditions. As we begin to really get in touch with the truth that God is not involved with violence, it will become much harder for us to justify our own violence in God’s name. I suspect that most of you, like me, are already sick and tired of hearing about the red cup “controversy.” If you haven’t heard of it, then you are fortunate. It has to do with the fact that Starbucks is using a solid red-colored cup this holiday season, and a few conservative Christians have decided that this is somehow anti-Christian and part of a larger “war on Christmas”. Never mind that previous holiday cups from the Starbucks chain included such blatantly Christian symbols as snowflakes, snowmen, Christmas trees, and reindeer — all of which figure prominently in the Bible (NOT!). Yet, somehow, those cups were more “Christian” than the solid red color of this year’s model. There are a couple of important truths to realize here. One is that NONE of the Starbucks holiday cups over the years has had a blatantly Christian theme (no nativity scenes, no crosses, no depictions of Jesus). The other is that MOST Christians couldn’t care less about what their coffee comes in this time of year, despite the media’s seeming desire to have us believe that all Christians are angry about it (all Christians haven’t been able to agree on, well, much of anything over the centuries, really). But the Christian right needed something to focus on as the symbol this year of their “war on Christmas” narrative that has delightfully become part of every Christmas season these past few years. That narrative, which is hardly supportable by any data, is intimately connected to another cherished narrative of the conservative Christian movement: that the United States is a Christian nation. That narrative goes so far as to say that the founders of the country were evangelical Christians — a historically indefensible claim, but history is beside the point here. The Christian right has created its own version of reality, in which the founders cherished a personal relationship with Christ and in which, until recent years, the entire US of A was thoroughly and devoutly Christian. It is a version of reality that bears little resemblance to US history, or to US culture today, but it is one in which they are deeply invested. As a result, any sign that can be construed as pointing toward a receding of Christianity from the public square becomes part of the imagined “war” on Christmas and/or Christians. And apparently, the fact that the Starbucks cup this year is simply red without any symbolism that connects clearly with Christmas has become just that sort of sign this year. But let’s be clear about what really lies behind all of this: a deep, almost paralyzing fear of diversity. The bearers of the “war on Christmas and founding fathers were evangelicals” narrative have a vision of the United States that doesn’t have any room in it for people who don’t look and think like they do. They are terrified of “otherness”. Ironically, the ministry of Jesus was primarily directed toward those who were considered “other” by the culture of the time. Jesus spent a great deal of time and energy going out to meet those who had been cast aside as other or unclean or dangerous in order to assure them that they were just as loved by God as those on the inside of cultural privilege. Yet those who claim to be followers of Jesus do everything in their power to keep the “other” at bay, and regard any acknowledgment of difference to be tantamount to a war against themselves. It is time, I think, that we stop cooperating in the propagation of the twisted vision of the Christian right, and the distorted, fear-based narratives that go with it. The press is not obligated to report on every outrageous thing that some Christian pastor gets it in his head to say. It is time that the majority of us who don’t buy into this vision and these narratives to stand up and reject them, and stop allowing them to attract the attention that, frankly, they don’t deserve. We are not a Christian nation. It is true that Christianity has figured prominently in our history, and has influenced many aspects of our culture. But while the majority of the population may still claim some connection with the Christian tradition, the majority of the population no longer actively engages with that tradition in any formal sense with any kind of regularity. And they are certainly not encouraged to do so when what is held up in public as “Christian” is little more than fear and prejudice dressed up as religious devotion. This past Sunday, as part of our celebration of All Saints Day, we heard the story from John’s Gospel about the raising of Lazarus. It’s a story that I have heard many times, of course, but this time I was struck by something that had never caught my attention before. Near the end of the story, when Lazarus comes out of the tomb, Jesus says to those present, “Unbind him, and let him go” (John 11:44b). On the surface, this is an instruction to remove the linen strips that had been wrapped around Lazarus’s body after he died. But in the gospels — and, perhaps, particularly in John — the surface or most obvious meaning is hardly ever the deepest meaning. And this past Sunday, as we remembered those whom we love who have departed this life, I heard these words of Jesus as guidance in the journey of grieving. Whenever we suffer the loss of a loved one — or any sort of loss — it is hard for us to simply let go of that loss and move on. We need to spend time in that dark place between life and death, facing our own pain and anger, facing our questions and our uncertainties. In the story of the raising of Lazarus, Mary and Martha might have physically been outside of Lazarus’s tomb, but their spirits were inside that dark cave with him. Part of their pain revolved around the words Martha spoke to Jesus upon his arrival: ‘Lord, if you had been here, my brother would not have died.’ It is a statement that masks a question: How could you have let this happen, Jesus? And even though we know that death and loss are an inevitable part of our lives, we often sit in the dark cave of grief wondering the same thing, trying to reconcile the pain of loss with the proclamation of God as love. 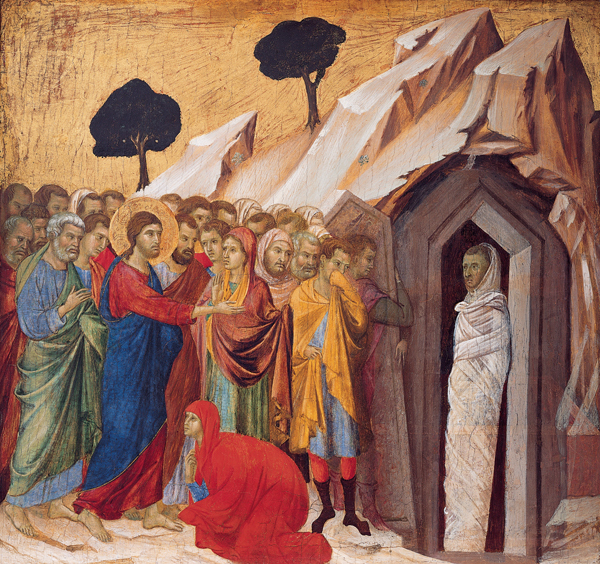 Jesus calls Lazarus back to life by crying out his name, and telling him to come out of his tomb. But that invitation is not just for Lazarus. It is also for Martha and Mary, because as Lazarus comes out of that dark place between life and death, so do the spirits of his sisters. And then Jesus invites them to do one last thing: to unbind their brother, and let him go. Whenever we sit in the darkness of grief, Jesus begins to call to us to come out. Sometimes we are able to hear that invitation quickly. Often, it may take weeks, months, or even years to hear that call. It is a call to come out and unbind our loss and let it go — which also involves unbinding ourselves, and letting ourselves move forward. The only way we can do that, I think, is when we trust that as we unbind and let go, there is One who is prepared to take that which we let go and hold it for ever in love. That One will hold not only that which we let go, but will also hold us in our act of unbinding, letting go, and moving forward back into light. That is what faith really means: to trust that there is One who holds us, and the universe, always in an embrace that even death cannot wriggle out of.